The first thing to do when you set up a new Services account is to create a Service Type. Once you understand what a Service Type is, it makes perfect sense, but at the start the term can be confusing. The new Add Service Type Wizard gives first-time users the context they need to get started and power-users the tools to create Service Types faster than ever. If you are an Administrator for a Folder you can find the Wizard by clicking the + Service Type button. The Wizard will walk you through the following 3 steps: name, times, and teams. 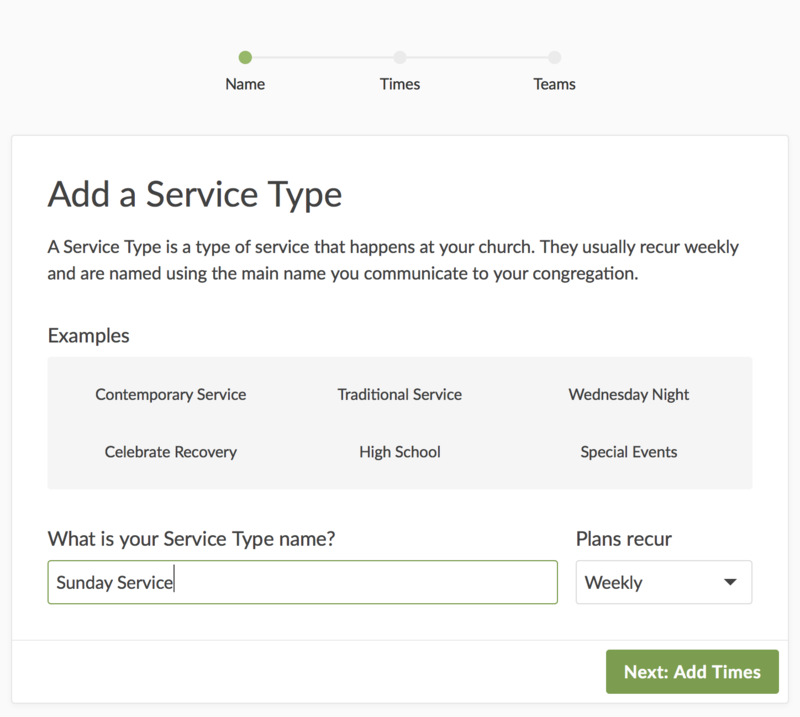 In addition to explaining what a Service Type is, specific examples are front and center. Some users who have one service that occurs multiple times will mistakenly make completely separate Service Types, instead of adding multiple Service Times. Allowing you to create your first times as part of the Setup Wizard should make this clearer and easier for everyone. The default time is an hour-long 8am time for the upcoming Sunday that you can then customize. If you add a second time, we automatically change the default time to start 30 minutes after the first time ends and using the same length. The last step is adding teams. 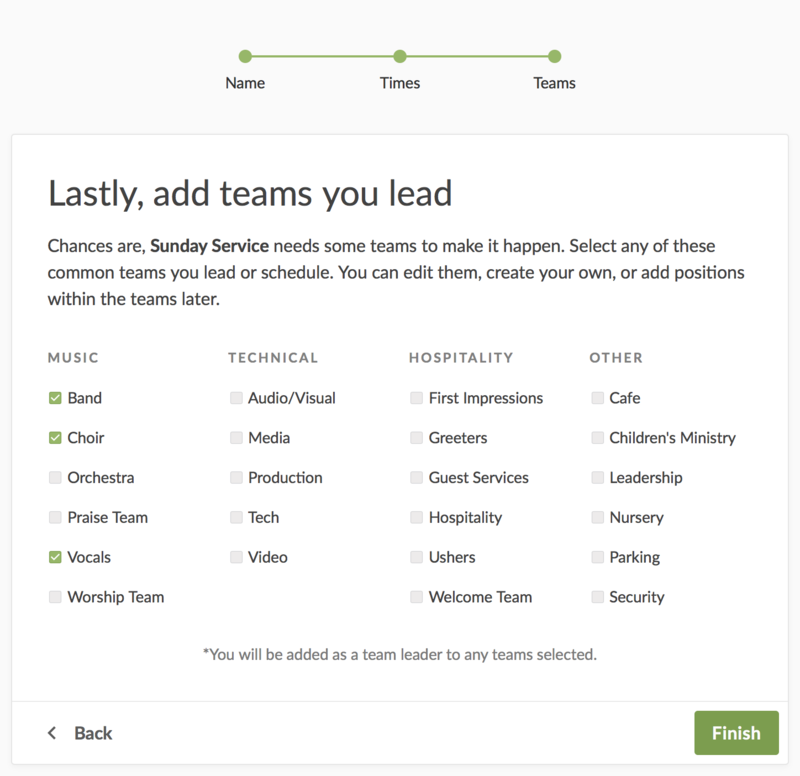 We looked at the most popular team names across all churches and added them as suggestions. Any Teams you choose will also have sample Positions added to them. 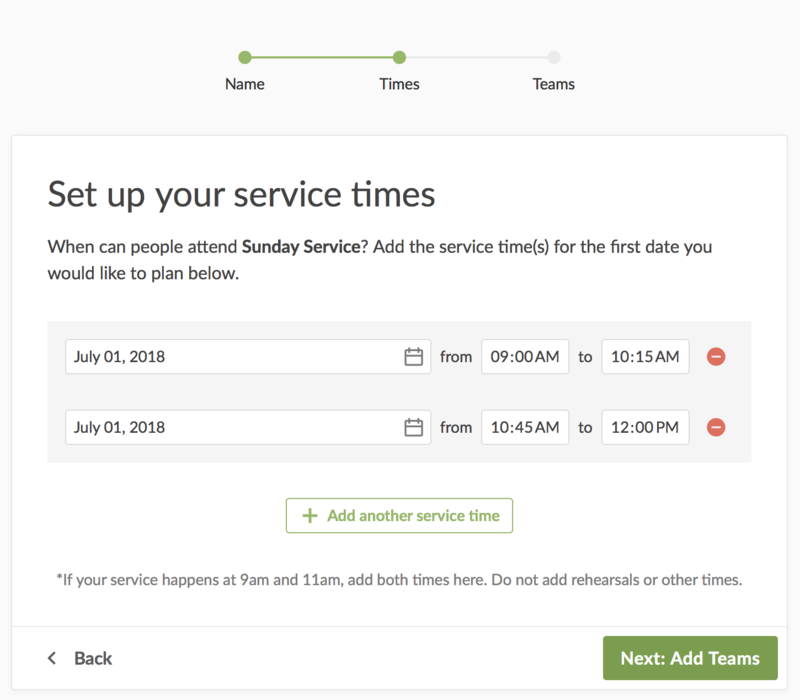 If you lead or schedule teams, you can choose the closest options from the list and customize later, or ignore this step and manually add them after the Service Type is created. We hope by clarifying the purpose and structure of a Service Type before it is created will help you set up your account with confidence, and squeeze every last drop of efficiency out of Planning Center Services.